The Titanium Signature Series diesel fuel lift pump was engineered by FASS Diesel Fuel Systems to be the top performing, longest lasting, quietest and most reliable aftermarket filtration system in the diesel industry. Rated at 250 gallons per hour and backed by our available limited lifetime warranty the Titanium Signature Series fuel system can support your GM Duramax 6.6L diesel engine with enough fuel for 900-1200 HP.. A Titanium Signature Series fuel system also offers advanced filtration benefits that will help protect your Duramax’s injection systems, effectively extending the life of your Injection Pump and Injectors. These Benefits include an improved filtration rating of 3 Microns, a built-in water separation filter and FASS Diesel Fuel Systems patented air/vapor removal process. Duramax diesel engines are known for having injector failure issues; this can be caused by several different factors and FASS Filtration System is designed to eliminate those that are fuel related. 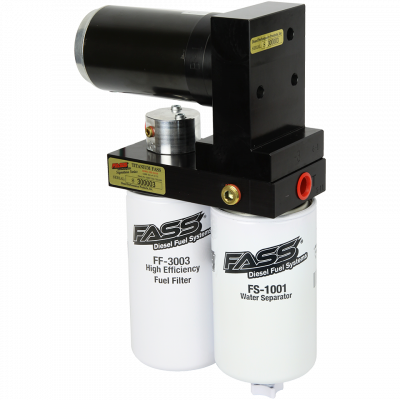 This kit includes a FASS STK-1002 (Bulkhead and Suction Tube Kit). Machined from 6061 T-6 Billet Aluminum, the Bulkhead fitting functions as both a suction tube and return and features a 5/8?” Suction Tube and suction fuel line along with a ½”” Fuel Return Port. This new and improved version from our previous Suction Tube Kit allows the user to plum their FASS return line directly to their bulkhead fitting, eliminating all cutting of the filler neck, and significantly speeds up the installation process. The pickup tube is fabricated out of PTFE Teflon which can be easily cut to adapt to different depth of fuel tanks. Properly installed, you can safely operate down to about 1/8 tank of fuel. Bolt On Bracket Mounts old mounting styles required drilling or welding when mounting your new pump. This has now been simplified with our new bolt on brackets that utilize your Ford Super Duty factory bed bolt, the bolt that secures your truck bed to your frame. Mounting your Titanium Series lift pump takes only minutes and all brackets are made from machined steel for superior support and strength.